For every pair of sunglasses sold, DIFF donates a pair of reading glasses to someone in need! DIFF creates chic sunglasses that stand up for greater good. I am all about rallying for a cause! They have a grand selection designer options in effortless and affordable styles. I have been styling these cat-eye mirror shades to add a bit of glamour to my bundled up fall layers. I love that they can hide my tired eyes from early mornings // late nights. They seriously give me mega-confidence! Sophisticated, stylish, and just in time for the holidays, DIFF is running their biggest sale ever! Starting Thanksgiving evening through Cyber Monday purchase a pair of sunglasses and help DIFF continue to do good in the world! This is one of the biggest sales DIFF has ever run, no code needed! (Excludes new styles and licensing.) Make a difference today! Wishing you all a happy and peace-filled Thanksgiving! Besides black, white and navy, there are a few color schemes I constantly gravitate towards. Bold orange-reds. Vibrant or muted yellows. Cool shades of pale blue. And vintage pink. Of course, these are the shades that easily mix and match – constants in any wardrobe that fall into the “neutral” category. Then there are others that speak. There are shades that can instantly lift a mood. When simply wearing a color makes you feel good, it better become a regular. Also, if you like my JORD Wood Watch (I've been lusting after one since Rob got his) you can get 25% off to any watch site-wide here. When dressing, colors can represents an idea – or makes a statement on their own. Dusty, pale-pink a symbol of romantic love. Maybe it’s a matter of opinion, but in color psychology pink is a sign of hope. It’s a positive, full of warmth and comfort. A color of feeling. Youthful. Feminine. It can read playful, cute, or charming even, but I have come to find it also represents a strength --a banner for the power of female. My blush femme tee already feels like an old trusty friend. I remember growing up my favorite shirt was a sort of ugly üuber soft worn-out baseball tee of my dads. That's what this reminds me of. Even though this babe is new, she is a plain pink power player full of nostalgia. It’s my favorite on rotation right now. Women, you know what I’m saying. I am all about lifting up my fellow females. She is a shout out to my suffragists who fought before me for their right to vote, and advanced causes for birth control, civil rights and economic equality. The fight we are still fighting. We need gender equality, protection for immigrants, minorities, LGBTQ rights and access to women’s health services, and so much more. Maybe it’s in my color, but it’s also in my persuasion. Pink speaks softly. Clearly. Loudly. Strongly. Speaking of pink, did you notice the subtle embroidery below my jeans pocket? I had to have these straight leg mom-jeans when I saw the hard-worn details. And raw-edge hems and if you get close enough you will know – girls bite back. Receive an instant 25% off gift code to JORD WOOD WATCHES HERE. What colors seem to dominate your wardrobe? 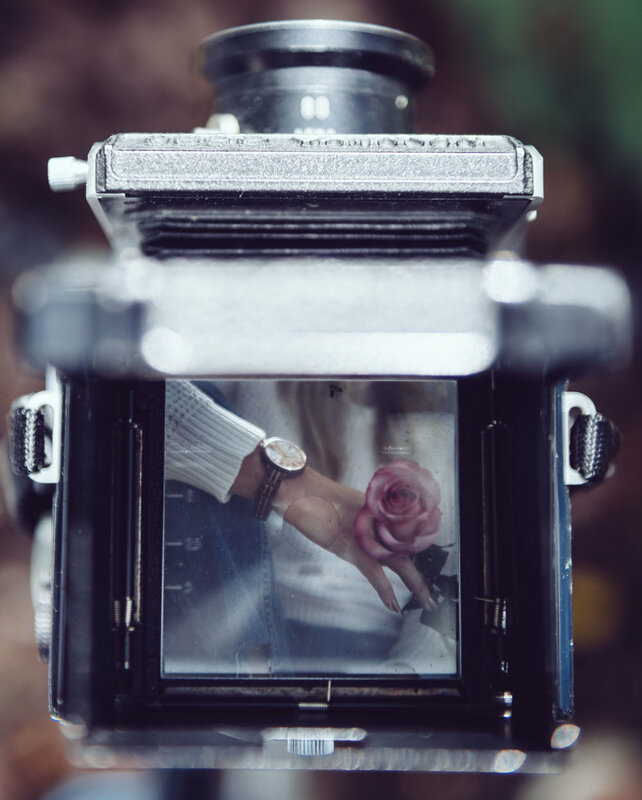 What do you think that says about you? I'd love to hear your thoughts in the comments below! Little white ankle boots have been on my “list.” When I stumbled across these faux patent ankles boots at Zara, (and for a good price) I knew they were going to be my favorite newbies for fall. Bight white pops against the moody autumn skies and looks so cool with everything - dresses, jeans, and skirts. Be warned - they run a little small. I wish I would have sized up, but after breaking them in they have little give and are easy to walk in, with the low kitten heel. I shamelessly stalk Zara for outfit inspiration and fell in love with this minaudière - a small, decorative handbag often without handles or a strap. This one features a handle, and an adjustable removable shoulder strap. It’s simple gold metal hardware is so 60s-mod. It reminds me of a bag one of my Barbie dolls had growing up! Maybe it was the nostalgia but I am so in love with this little purse. I know it will be the perfect companion for date nights and events around town. Just the right size for a phone, lipstick and card/money holder. As for the rest of my outfit, the distinct golden/mustard yellow color dress is an oldie from Anthropologie that also has that retro drop-waist silhouette I love, and would be super-cute with over-the-knee boots! 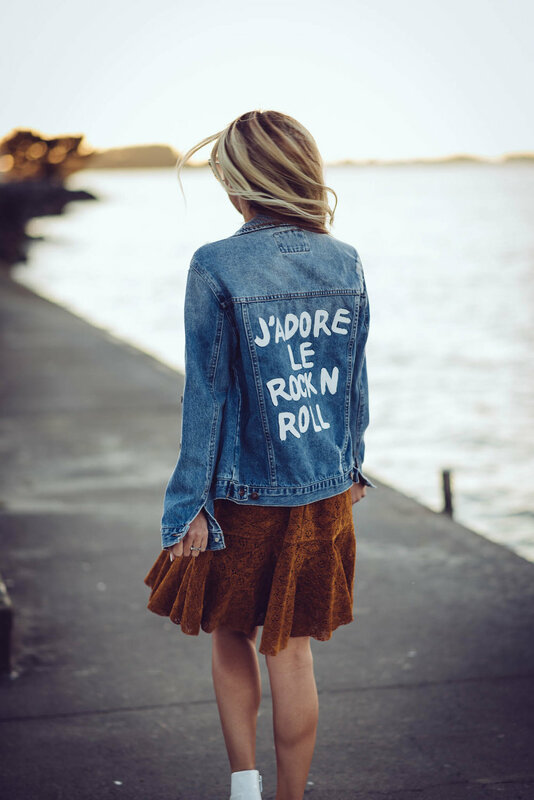 The denim jacket with distressed design, "J'adore Rock N' Roll" graphic on the back, was a sale item I happened upon for $10 folks! Playful and in that classic shade of blue, it will be a great laying item come cooler days. You guys know black and white dominate my wardrobe, and these white boots and black bag will be sure to mix and match with ease, while elevating an everyday look! When searching for new statement pieces for fall, make sure they are things that will easily transition into your own wardrobe. Stick to a color pallet, think about what makes sense for the season (boots, coats, hats, scarves) and avoid anything too “trendy” that you might only wear once or twice. These should be things that you know will get lots use. I hope you all have a wonderful rest of the week and make sure to share your new fall finds in the comments below! I love hearing/seeing what everyone is wearing as the temps start to cool!